The Cotton Ball Diet is not complicated. One dips cotton balls in orange juice or lemonade and then (gasp) eats them. It is said that the cotton balls expand in the stomach, creating the illusion of fullness. Weight loss inevitably follows. There are, as you might expect, a few problems with this diet. First of all, cotton balls aren't actually made of cotton anymore, so claims of “all natural diet” fall apart immediately. 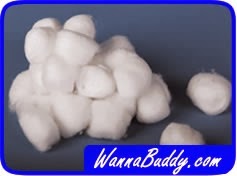 Modern cotton balls are actually polyester strands that contain bleach and ester monomers that would be labeled as carcinogens if packaged as food. The second problem is more serious and immediate. Our digestive systems can't break down cotton balls. That means that our intestines can develop a blockage from massed cotton ball fibers. This mass, called a bezoar (a great Scrabble word, by the way), can cause pain, vomiting, diarrhea and even death. So if a friend sends you a YouTube video proclaiming the miraculous benefits of the Cotton Ball Diet, just say no. Cotton, or actually polyester, is better used in tee shirts.